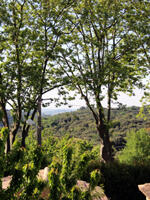 Faugères is a quiet, unspoilt mediæval village in the Occitanie region of south west France, providing an ideal location for anyone wanting a 'retreat' break — to walk, write, to explore an historic and picturesque area or simply to enjoy a slower pace of life. 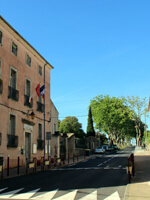 The village, with about 420 residents, gives its name to one of the most highly-regarded wine appellations in southern France. The characterful 'village house' evolved from a single-room bakehouse above a storage 'cave' to become a two-bedroomed home with two reception rooms and a terrace. It's great for as many as four or five holidaying together or for one creative individual to spend some time alone, working, away from the hubbub of urban life. It is in one of the village's oldest streets, behind the Protestant church (Temple) and a short walk from Dame Jane, the small shop/bistro (and, from 8am-12noon, post office) selling newspapers, bread, cakes, wine and some deli items. A new 'artisan' boulangerie patisserie — L'Arbre à Pains — opened next to the petrol station at the west end of the village in 2018. 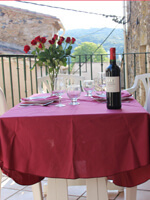 Faugères is on a south-facing escarpment, between the black mountains and the sea, an ideal base for a holiday exploring historical sites, walking, cycling, lazing on the nearby Mediterranean beaches, visiting wineyards or just relaxing on the terrace. The area is steeped in history and enjoys a glorious Mediterranean climate. Getting there is easy — with fast rail links from nearby Béziers or Agde to Paris. Béziers-Cap d'Agde airport is close by and the A75 autoroute a few kilometres to the east. 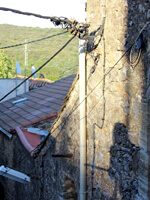 High-speed broadband and wi-fi have been installed so the house is an excellent retreat for writers and creators. The cottage is owned by friends and is available for rent with charges designed to cover running costs rather than make a profit, with discounted rates for members of trade unions and other organisations. Click here for links to videos of Faugères and the surrounding area.